When you don’t want shine! Finding the perfect product that gives me my desired finish and protects matt surfaces when I’m detailing has proved tricky! Previously I’ve tried numerous products where the results proved disappointing – leaving an unnatural shine or a greasy residue that looks terrible! 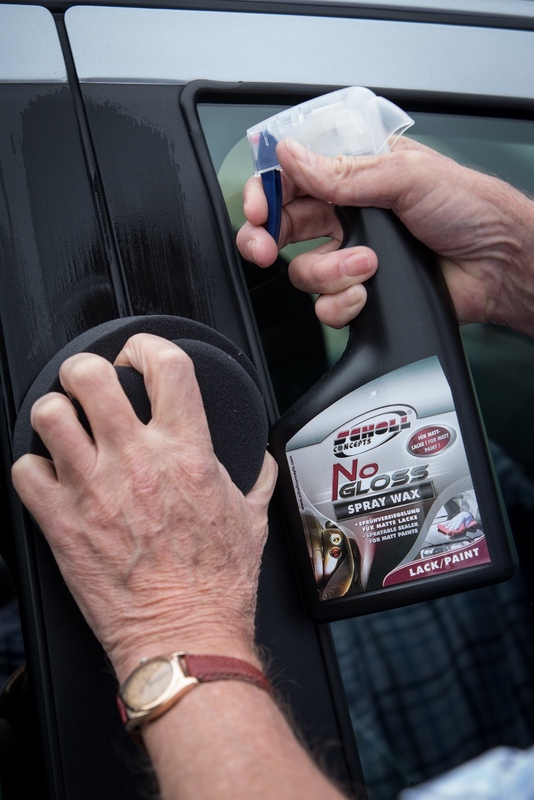 Matt-wrapped vehicles, matt paint and non-shiny smooth and textured plastic parts all demand thought and care when choosing a suitable dressing – but finally I’ve found a solution and what’s more this one product is suitable for use on all these surface types. Scholl Concepts NoGLOSS is described as a spray wax, but doesn’t leave the gloss associated with traditional spray waxes. It was developed in association with Audi as part of Scholl Concepts’ matt paint protection system (check out the mattpaint_matrix) – a comprehensive cleaning, maintenance, care and protection system for matt surfaces. A sprayable sealant, it is easy to apply and won’t affect, scratch or destroy matt paint surfaces and protects from weathering and persistent soiling. I’ve found it to be the perfect detailer’s solution on door strips and other plastic trim, carbon wrapped vehicles and parts, matt vinyl and vinyl wrapped vehicles and for matt plastic parts. It’s easy to use and leaves a nice finish – a factory finish that doesn’t look fake or cheap. The results after application of NoGloss are clean and smart. There’s no residue. My application technique of choice is to spray on a soft cloth or black hand puck, wipe on and buff off with a soft microfibre. This gives a nice, even finish. It can be sprayed on directly, but personally I don’t think it dries as nicely. The result is just how I think freshly detailed matt surfaces should look.